This is one of those hot topics that so many parents have asked about. How can parents monitor and keep up with what our kids are doing online? Whether it’s your family computer, a child’s iPad or your teen’s cell phone, there are definitely some great social media monitoring tools currently available on the market. If you want to keep track of your family’s digital activity they’re definitely worth looking into. 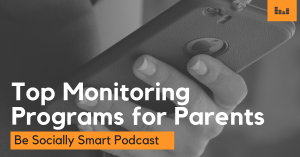 Today on the podcast, Caleb gives an overview of the top social media monitoring applications and web-based programs that are currently available. While none of these tools can keep your kids 100% safe, you just might find a great option featured in this episode that will work for your family!